Seriously, I'm not sure what to make of this novel. Halfway through, I didn't know where the story was going. I've just concluded reading it, and sad to say, I still don't know where the story went. What's the plot about anyway? It's about middle-grader Meg Murry, her "odd" little brother Charles Wallace (all throughout, he will always be referred to as "Charles Wallace", not just "Charles"), their new friend Calvin, Meg and Charles' missing father, and a tesseract. But what is a tesseract, as the storyline was anchored on this concept? "...also called an 8-cell or regular octachoron or cubic prism, is the four-dimensional analog of the cube. The tesseract is to the cube as the cube is to the square. 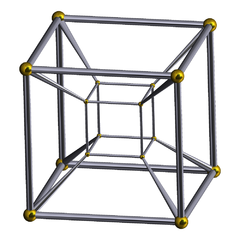 Just as the surface of the cube consists of 6 square faces, the hypersurface of the tesseract consists of 8 cubical cells. The tesseract is one of the six convex regular 4-polytopes." So, there you go. How does it figure in the story? You need to read the book to find out. Ah, the story. The story, as I said, was difficult to comprehend. It offered my brain some mental calisthenics, to its credit. The writing was bad; I had been looking forward to a straightforward storytelling considering that this is a children's book (and a Newbery Honor recipient, at that), but I was frustrated with the narrative. 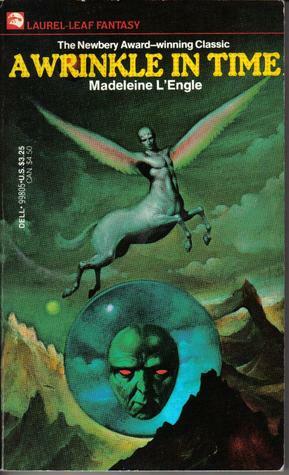 It didn't help that the book was more on science fiction/fantasy than I would care for, as I am not so much a fan of the genre than, say, general or contemporary fiction. Plus, the characters were so poorly, uh, characterized that my heart bled for them. For instance, Meg was depicted as "difficult" and Charles Wallace an oddball because of the way he speaks, churning out adult language from his very young mouth, but as to why and how, I never got to know. Calvin felt out of place, an additional character that merely played a prospective love interest to Meg, and in the few instances in which this angle was played, I actually, really cringed. Loudly. I mean, come on. And then there were the creatures and beasts from other planets and/or galaxies, but I guess some leeway is allowed where they are concerned; after all, they are otherworldly beings, so they can be anything at all. In sum, I felt that the book, in the beginning, held a lot of promise, but failed to deliver in the end. Maybe if the writing had been better, that would have helped. That's not the case, unfortunately. The over-all concept and lesson - I guess the one which won it the awards and accolades that it didn't deserve - is that, love conquers all. Apparently, even foul creatures from outer space.